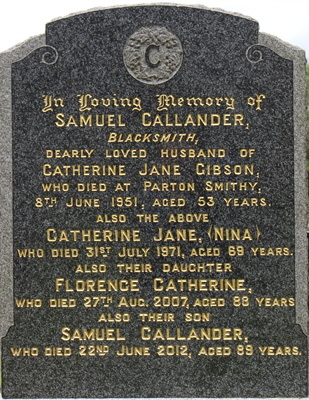 Sam Callander died at Parton on 22 June 2012 just before his 90th birthday, and, like JCM, is buried at Parton Kirk. He was educated in Newton Stewart and Castle Douglas High Schools. Sam moved with his parents to Parton in 1936 when his father became the local blacksmith living at the smiddy. Sam continued to live there, and was employed as a skilled millwright by J & R Wallace, Agricultural Engineers in Castle Douglas for 48 years. 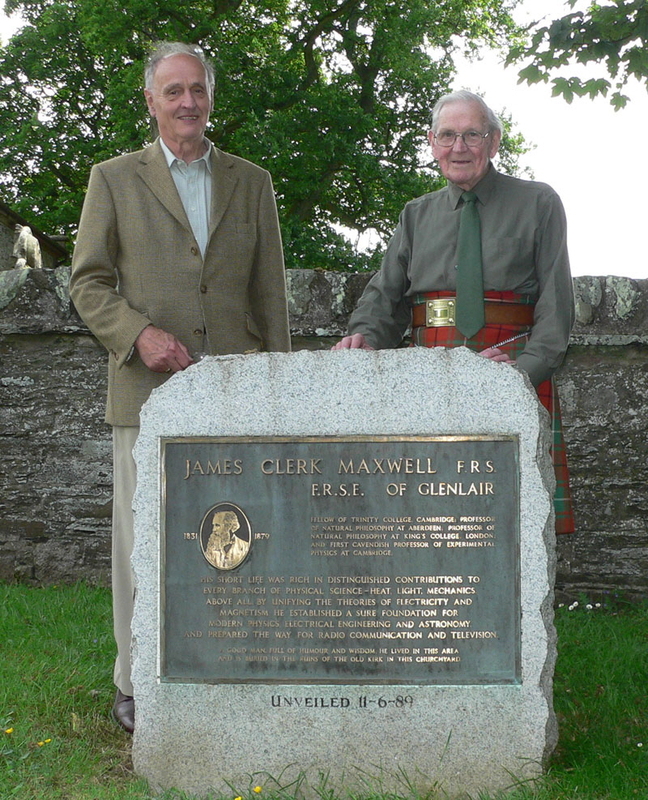 Sam Callander devoted much of his life to promoting the memory and achievements of James Clerk Maxwell of nearby Glenlair. Sam’s knowledge of all things pertaining to Maxwell became encyclopaedic – an interest first fostered by a previous minister in Parton. Largely self-taught, he came to comprehend the nature of Maxwell’s laws of light, electricity and magnetism which laid the foundations for radio, television and radar; and Maxwell’s work on colour which became the basis for colour television. As Sam’s knowledge grew, so too did his collection of books and artefacts relating to Maxwell, this is now owned by the James Clerk Maxwell Foundation and is known as “The Sam Callander Collection”. Among the collection of papers and memorabilia which Sam gathered and periodically put on display at Parton village hall, were biographies of Maxwell in foreign languages including Japanese, Chinese and Russian, presented to him by the authors. The sweep of Sam’s exhibitions was very wide – with something for everyone and much for many: from historical detail of Glenlair through incidents and people associated with JCM as a child, and later as laird and scientist. The effort of mounting the exhibitions must have increased over the later years, but Sam seemed to take it all in his stride. In his retirement Sam ran the village store and post office in Parton and therefore was often the first port of call for strangers looking for the great man’s grave . Sam’s continuing welcome over the years to the visiting scientists, academics and JCM enthusiasts who landed on his doorstep from all over the world was legendary. Over the years Sam was contacted by many people researching Maxwell’s life, including Prince Charles and Lord Reith, first Director-General of the BBC, with whom he corresponded for a time. Lord Reith’s father had been a student of Maxwell at Aberdeen. Sam was invited to dine at the Royal Society; and he was also invited in 2008 to the unveiling of the new statue of JCM with his little dog Toby – the first statue to be raised in George Street, Edinburgh in 98 years. This was an event which brought Sam huge pleasure and pride. Sam presented a dapper kilted figure on many occasions at various Edinburgh venues, when concerts, plays and exhibitions were organised by the JCM Foundation to raise awareness of Maxwell and funds to buy the Birthplace. One ambition dear to him and not achieved in his lifetime was for the UK to achieve a commemorative postage stamp featuring Maxwell. To his disappointment Royal Mail has not yet obliged! But Sam did have his own stamp collection - stamps from other countries featuring the great man. James Clerk Maxwell was not the whole story in Sam’s life. His great energy and enthusiasm for the life of the community of Parton rightly earned him the local sobriquet ‘Mr Parton’. His many interests included amateur dramatics – he was one of the founder members of the Crossmichael Drama Group - also gardening; stamp collecting; photography; Scottish country dancing; wine-making (well, he tried!) His interest in local history involved him as a founder and committed member of the Galloway Preservation Society. 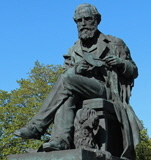 Throughout Sam’s life his personal religious beliefs were important to him – as was the case with Clerk Maxwell. Sam was a faithful servant of the Kirk in Parton, being ordained elder in 1951 and serving for over 60 years. Other offices he held within the Kirk over the decades included Sunday school superintendent; beadle; bell ringer; treasurer. He held the post of village hall keeper for over 60 years, could this be a record? 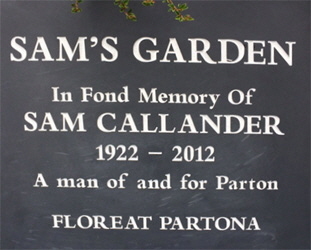 A garden at the village hall is named in Sam’s honour and was dedicated at a ceremony in April 2017. In all these activities, interests and involvements in the life of Parton village and the wider setting of Dumfries and Galloway, Sam will be remembered for his quiet and unassuming manner, his gentle sense of humour and the twinkle in his eye. It was standing room only for Sam in Parton Kirk: he will be sorely missed by many.